India on Wednesday signed a $1 billion deal with American defence and aerospace major Boeing for procuring four additional ‘Poseidon-8I’ long-range maritime surveillance and anti-submarine warfare aircraft. This contract is a follow-on order to eight P-81 planes already bought by India in a direct deal with the firm worth $2.1 billion, said a PTI report quoting defence sources. 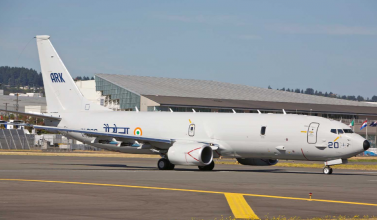 The acquisition of additional ‘P-8I’ will be a shot in the arm of the Indian Navy as the country has been building up its naval surveillance capabilities. Armed with lightweight torpedoes and rockets among others, the Navy is extensively using the P-8I to keep a strict vigil over the Indian Ocean, which has seen numerous Chinese submarine forays, including docking of a nuclear sub in Sri Lanka. They are often termed “intelligent hawk eyes”. The long-range maritime reconnaissance aircraft has an operational speed of 450 miles per hour and a range of 4,500 nautical miles. The P8Is are used for not only for long-range patrol but is also equipped with deadly Harpoon missiles for anti-submarine warfare. The $2.1 billion deal of 2009 was then the largest defence deal India signed with the US. With Wednesday’s deal, the total value of defence deals India has signed with the US in the last one decade comes to around $15 billion. The latest contract for four P8Is was inked during the ongoing visit of US Under Secretary for Defence on Acquisition Frank Kendall, and is seen as a sign of growing Indo-US defence ties. Last year, India had signed a $3 billion contract with the US through Foreign Military Sales route for 22 Apache and 15 Chinook helicopters. The country is also working on a deal to get 145 pieces of M777 light-weight howitzers from the US, the sources said.